With the coming of spring we seek for a new hairstyle to add new breath to us, and with the coming of summer we want a hairstyle that will be easy to manage in the hot weather. For these warm season shag haircut is the best hairstyle to choose. It will fit any hair type cause to thin hair shaggy layers will add volume, while from thick hair they will take away the bulky texture and heaviness. With shag haircut you won't need to loose hair length that you love so much I am sure. Let's have a look at trendy long shag haircut ideas here, and get convinced that shag haircut is oh-so stylish and fashionable. Tender and sweet hairstyle that makes a woman so feminine. The shag layers add the right touch to the blonde long shag haircut thus turning into a accurate messy hairstyle. Long shag haircut is sure to boost the volume of thin hair. The layers all over the length and the caramel highlights will turn your long layered hairstyle into a real stylish thing. 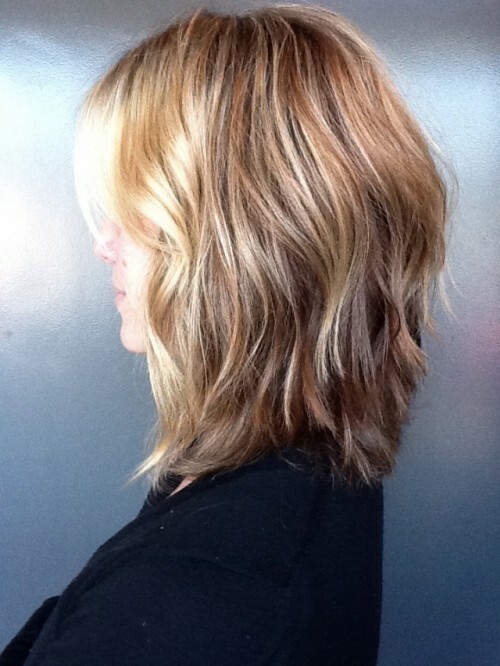 Cropped layers always make the shag haircuts look thicker and more voluminous. And if you appear to have such sweet honey highlights be sure to win hearts. Shorter back part of this long shag haircut only makes it more attractive. Here you see Mandy Moore long shag haircut that is a masterpiece among its type. The shag layers starting from chin length give ore definition to style. Moreover, it's easy to style for every day, just tousle hair and go out. If your have naturally curly hair or better wavy, you can opt this stylish long shag haircut with choppy ends, that will be styled in an instance. Besides, the smart ombre hair color will make the job.